QUESTION: Okay. The second question is: The State Department has recently said that it is in constant contact with the Muslim Brotherhood, as with the other political groups, you see? QUESTION: So do you think that these contacts have any effect on the United States relations with Egypt? And are these just mere contacts or support? Because this is very important for the Egyptian public opinion. Thanks. MS. HARF: Well, they’re contacts, and let’s just – I’ll put it in a little context here. We think it’s important to have contacts with all the parties in Egypt, because all the parties in Egypt ultimately are going to need to be a part of Egypt’s future, and that we want to help them be a part of that future and move Egypt out of the situation it’s in today. So we think this is important to do. Do we always agree, do they always agree with what we’re saying? Of course not. But we believe it’s important to have the dialogue. We don’t support one party or one group or one person. So when we’re talking about elections, when – I know there’s a lot of conspiracy theories about us supporting the Muslim Brotherhood or supporting the military or – there’s a lot. They can’t all be true, right? Because they’re mutually exclusive. But we don’t support one group. We support the process. We support the people of Egypt who make up these parties – right – as they are trying to determine how to get Egypt back on a better path. One wonders: if the Obama administration does not “support one party or one group or one person,” why did it try to urge the Egyptian people in general, the Christian Copts in particular, not to protest against former president Muhammad Morsi (“one person”) and his increasingly oppressive Muslim Brotherhood (“one party”)? Conversely, if the Obama administration is supportive of “the people of Egypt” in general, where was it when the Muslim Brotherhood and their supporters were terrorizing Egypt, and continue to do so—including by burning and destroying over 80 Christian churches? But when millions of Egyptians protested against the increasingly oppressive Morsi/Brotherhood government, leading to their ousting, it was then that the Obama administration reacted by reducing aid to Egypt. 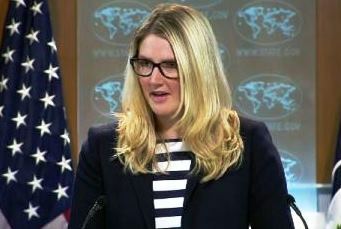 Harf yesterday confirmed that her nation is in communication with the Muslim Brotherhood but denied that this means it supports them. They’re just in contact—you know, “checking up” on each other. She said that the United States is in contact with all political parties in Egypt. In reality, they [Brotherhood] are no longer “political parties.” They are “terrorist parties.” She stressed that they do not support any particular person or political party, adding “we support the people of Egypt.” Apparently that explains why they stopped their aid and support? They “support the people of Egypt,” even as the Egyptian people cannot stand the Muslim Brotherhood, has rejected them, and is rejoicing because the government finally designated them as a terrorist organization. So this is the sort of “support” Mary Harf offers to the Egyptian people—that the United States is in contact with a terrorist organization. Regarding a “conspiracy” between the U.S. and the Brotherhood, she said this cannot be true, adding that they only “support the people of Egypt as they are trying to determine how to get Egypt back on a better path.” What’s it to you? If we want a democracy, a dictatorship, or just to stay as we are—we’re free to do so. I really don’t understand this idea whereby they [Obama administration] always show up saying “we support democracy” in the Arab world, and yet here is the result of their support: every nation they have put their nose in, they destroyed it. Filed Under: From The Arab World, Other Matters Tagged With: Egypt, Muslim Brotherhood, Obama, terrorism, U.S.